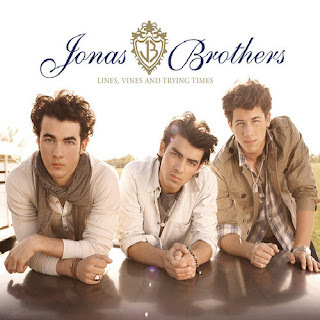 Jonas Brothers’ new album “Lines, Vines and Trying Times” debuts at number 1 on Billboard Hot 200, putting aside last week’s chart-topper Black Eyed Peas’ “The E.N.D.” to the second place. The boys’ album has sold more than 247,000 copies in its first week on sale, while the Peas’ effort manages to add 148,000 after garnering 304,000 units last week. This is the second time Nick Jonas, Joe Jonas and Kevin Jonas have their record debuting atop the U.S. albums chart. Last year, their album “A Little Bit Longer” also directly soared to the top spot on the chart, selling around 525,000 units in its opening week. Back to Billboard Hot 200, sitting at number 3 is Dave Matthews Band’s “Big Whiskey and the GrooGrux King”, and lingering at number 4 is Eminem’s “Relapse” which opened big with 608,000 selling point but this week pulls in only 72,000 copies. Rounding the top 5 is Incubus’ greatest hits collection “Monuments and Melodies” with 70,000. And, following at the next places are Lady GaGa’s “The Fame” and Chickenfoot’s self-titled album “Chickenfoot” which sit at number 6 and 7 respectively.